This is a new way I found to reset ssh port from WHM control panel if you ever lost SSH access because you forgot what is the port you are running, or something got screwed up in the middle of your sshd configuration. How can I reset SSH port from WHM? What happens if you change the ssh port and then forgot what was the port number? You won’t be able to access your SSH server anymore. But don’t worry, there are a few things you can do to fix this. 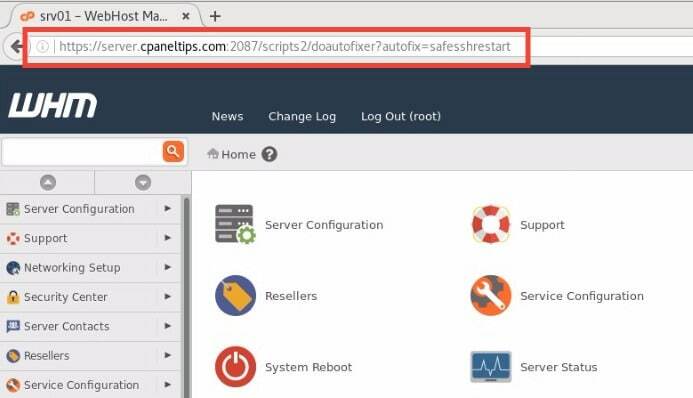 cPanel developers have built a cool ssh port reset script that can be used to you are able to reset SSH port from WHM control panel. 1. Log into WHM control panel as root. The result will be that your sshd daemon will now be running on the default port (22). At this point you are ready to login again using SSH and start editing your SSHD configuration. What happens if I already use port 22 for another service? If port 22 is already used by another app or service, the script will open another port different than 22. Now you know how to reset SSH port from WHM control panel in case you’ve been locked out of your server.